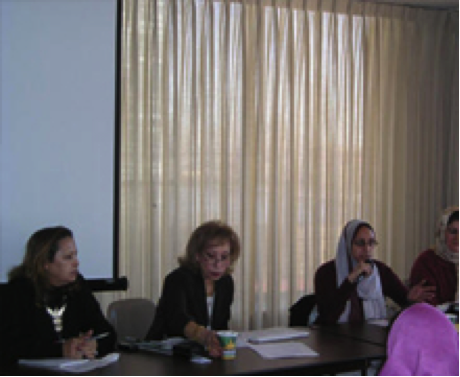 March 2005 - U.S. Federation for Middle East Peace (“USFMEP”) hosted an interactive panel discussion titled “The Rights of Muslim Women: Islam and Tradition” as part of the 49th session on the Commission on the Status of Women (“CSW”). The event was moderated by UFMEP President, Mrs. Salwa Kader, and focused on the roles and rights of Muslim women under Islam. The event was organized to further one of UFMEP’s core objectives to involve women in the process of conflict resolution and elevate their status in societies all around the world. Speakers included Ms. Safiyya Srkin, member of International Union of Anthropological and Ethnological Science, Ms. Mona Mikhail, professor of Arabic Literature and Women’s Studies at New York University and Ms. Nahid Mozaffari, editor of the PEN Anthology of Contemporary Persian Literature, author of the book Strange Times, My Dear and professor of Middle Eastern history at the New School in New York and Cabot University in Rome. 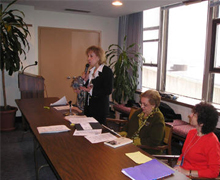 March 2005 - U.S. Federation for Middle East Peace (“USFMEP”) President, Mrs. Salwa Kader, moderated a panel discussion on “Women in Islam: East Meets West” as part of the 49th session of the Commission on the Status of Women (“CSW”). The event explored the dynamic perspectives of Muslim women in contemporary global society. Speakers included Mrs. Najat Ikhich from the YTTO Foundation, a non-profit dedicated to housing and rehabilitating women victims of violence, Mrs. Saud M. Marafie, a senior aero-biologist and social activist with the Kuwaiti Women Voluntary Society for Humanity, Mrs. Hadil El-Kholy, representative of CELWA in Cairo, Egpyt and feature speaker Dr. Saeeda Malik, a medical surgeon and Minister of Women Development and Social Welfare in Sindh, Pakistan.